← Gym rat no more? We spent Sunday morning on top of a parking garage at the Mississippi Valley Bicycle Expo and Swap Meet helping at the CyclingSavvy info table. What’s the best way to get to a bicycle expo? By bike, of course! I never would have found this on my own, as I don’t think the tree is particularly “tropical looking,” and it wasn’t in the spot marked on either of the foraging maps. Whether it was birds, humans, or just a low-fruit year, there were not many pawpaws to be found. A few ripe dropped fruits on the ground, and a couple more unripe that Matthew grabbed from a tree — not sure if they’ll ripen or not. Despite the low harvest, it was a successful mission in my book. We now know the exact location for future years AND there were some fully-loaded persimmon trees with fruit that should be ready before too long! After our little detour, we proceeded to the expo. 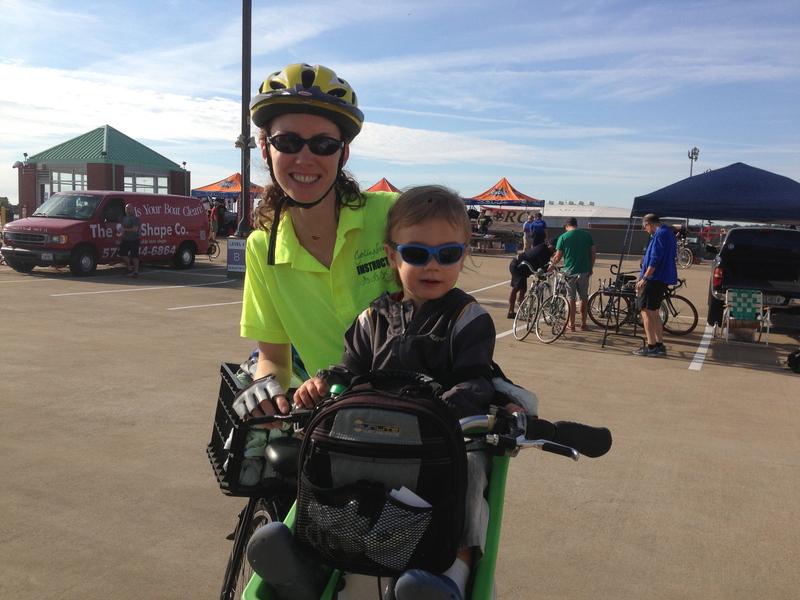 CyclingSavvy’s littlest fan needs a t-shirt of his own! 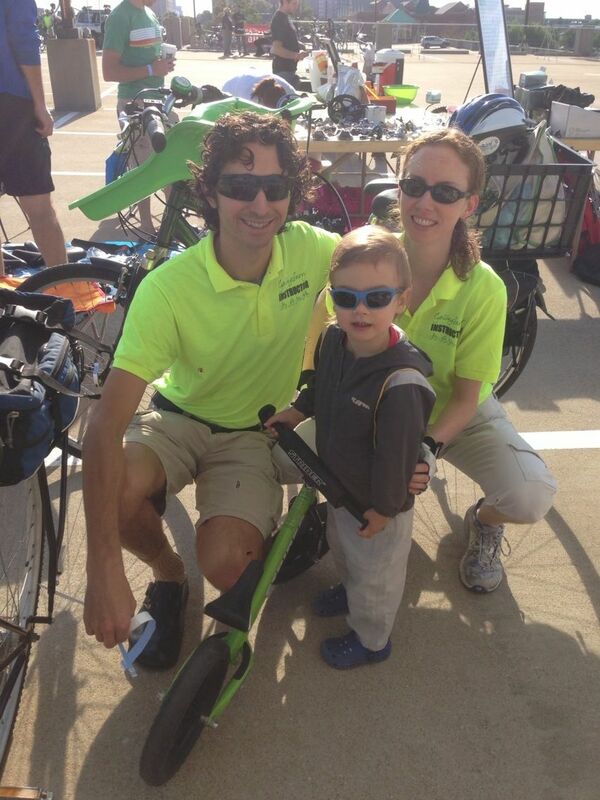 We bungeed Sir’s BalanceBike to Matthew’s rear rack, and Gabriel enjoyed riding it around the expo. Sir needs an advertising contract with the bike company. We also added one more [small] bike to our fleet, picking up a used tricycle for Sir. Our cargo capacity was already maxed out, so the trike is awaiting pick-up at a friend’s house. Want to find out what it’s all about? There are still a few spots open in this week’s CyclingSavvy workshop: course details and registration. *Bike expo photos courtesy of our friend and fellow CyclingSavvy instructor, Karen. 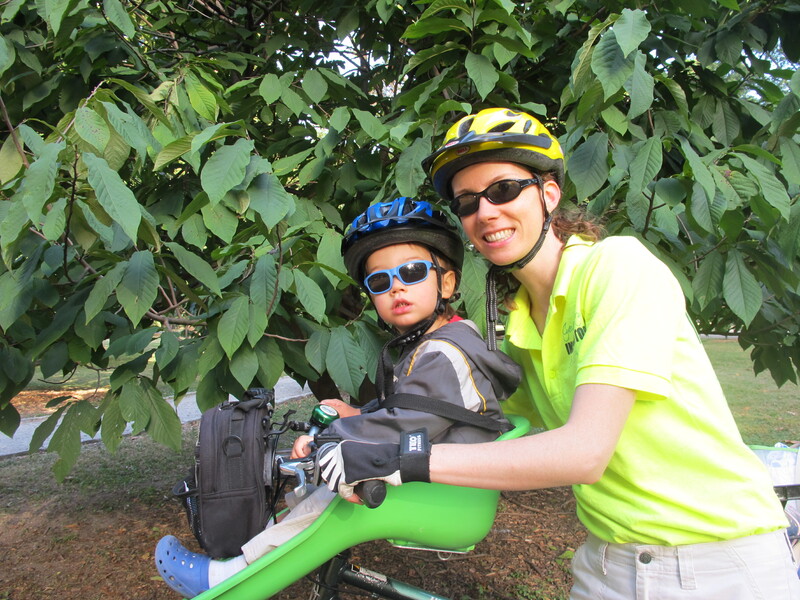 This entry was posted in Biking and tagged CyclingSavvy, foraging, st. louis. Bookmark the permalink. Fantastic! I desperately wanted to stop by the swap yesterday, but my busy Sunday would not cooperate. Great weather, and you made some excellent scores! I’m sure Sir will love a trike – I loved mine when I was small. I did get to ride my bike to church yesterday and I installed new folding baskets this weekend, so yay for that at least. I am still hoping to make it to a cycling savvy course, but Thursdays are out for me for a while as I’ve got rehearsal those evenings. Bummer on Thursday nights being out — both the September and October classroom sessions are on Thursday nights. It looks like we have a classroom only session on Wednesday, November 6th though. Downside is you will probably have to wait until spring to take the on-bike portions at that point, but that classroom session is a great starting point! I know. I was hoping to get the 22nd of August in before we resumed rehearsals and we ended up having a special rehearsal that night. The Wednesday might work, though (I’ll put it on there now). Thanks, Karen!! I have put it on my calendar. I very much expect to attend.